After a recent losing skid, Kurt Angle will address his WWE future on RAW. 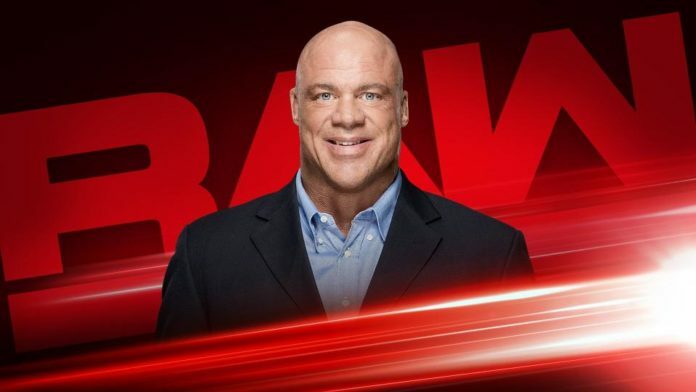 After suffering multiple losses in a row on WWE programming, Kurt Angle will address his future Monday night on RAW. The 50-year-old recently posted to his social media that he has something to say on Monday’s show. “From my amazing WWE HOF career, to my work as GM of Raw, to the way things have gone down the past couple of months, I will address my future in WWE this week on Monday Night Raw,” Angle posted on Instagram. This week’s episode of Monday Night Raw will emanate from the Moda Center in Portland, Oregon. Only one match has been confirmed for the show; Sasha Banks and Bayley will take on Alicia Fox and Nikki Cross. The winners will be the 3rd and final team from RAW to qualify for the Women’s Tag Team Championship Elimination Chamber match. Angle has been on a losing streak spanning back to the WWE World Cup tournament held at Crown Jewel in November. Angle was eliminated by Dolph Ziggler in the 1st round of the tournament. 3 days later he was destroyed by Drew McIntyre on Monday Night Raw. He was the 2nd elimination in the Royal Rumble recently as well, having been thrown out after just 3 minutes by Shinsuke Nakamura. Last week on RAW, Angle was defeated by Baron Corbin.